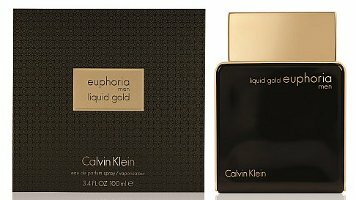 Calvin Klein has launched Liquid Gold Euphoria and Liquid Gold Euphoria Men, a new duo of flankers to 2005's Euphoria and 2006's Euphoria for men. The fragrances are currently exclusive to the Middle East. Overwhelmed by an addictive desire. Enter a world of luxury. Liquid Gold Euphoria ~ a woody oriental with cinnamon, black orchid and sandalwood. Liquid Gold Euphoria Men ~ a woody oriental with black pepper, saffron and sandalwood. Calvin Klein Liquid Gold Euphoria and Liquid Gold Euphoria Men are available in 100 ml Eau de Parfum. I’m surprised to see no oud listed in this middle-east exclusive. The lists of notes are too short to possibly include everything, though. So who knows. I know black-and-gold is a common colour scheme in the marketing of perfumes, but those boxes look very, very much like Tom Ford Black Orchid and Tom Ford For Men. Confusingly similar, in fact. True, but the bottles don’t look like Tom Ford at all. Not a huge fan of the Calvin Klein fragrances. Pardon my ignorance, but all the scents smell so much alike to me. I love, love, love the designer’s fashion sense, but perfumes, not so much. I would love to be able to wear this because of the title “Liquid Gold”. How unique is that? Love the name, but not sure if I would love the scent. It is a good name! But it is also the theme of a cheesy ( pun intended) Velveeta ad campaign! Ah ha ha! Excellent point. I smelled it yesterday (I live in Live in Lebanon, a middle eastern country), and yes it has Aoud but in a very soft touch on the top notes and I like it!